Thats the thing with Google. Suddenly, overnight, things seem to change with the search giant. All of a sudden an SEO, or nowadays even the SMO, the Social Media Optimizer, has to change their strategy because of the change Google made. Right? Well not always, in many cases if you understand the way Google thinks and works your basic strategy can stay the same, you just have to change some of your tactics. Make some minor adjustments and you continue to do well in the SERPS. Google’s latest integration of Google+ into the SERPS might indicate there are more changes we have to make to our strategy to stay visible in Google. After all, we now have the ‘suggested users’ more prominent appearing in the results. And the results are mixed with social elements coming from Google products. How to make sure we are visible there? And how to become one of those suggested users? That last one I want to focus on here: I want to be one of the suggested users as much as possible. But how? Let’s analyze. What lists are we talking about? Let’s first define what we are talking about. Google’s latest change has one major implication which has been discussed around the web the past few days with the “is this right or wrong” angle. Is Google promoting their own products too much and shouldn’t Twitter or Facebook accounts be as prominent as the Google+ accounts? That is a discussion which we will not go into in this post. What we are talking about is that functionality though. 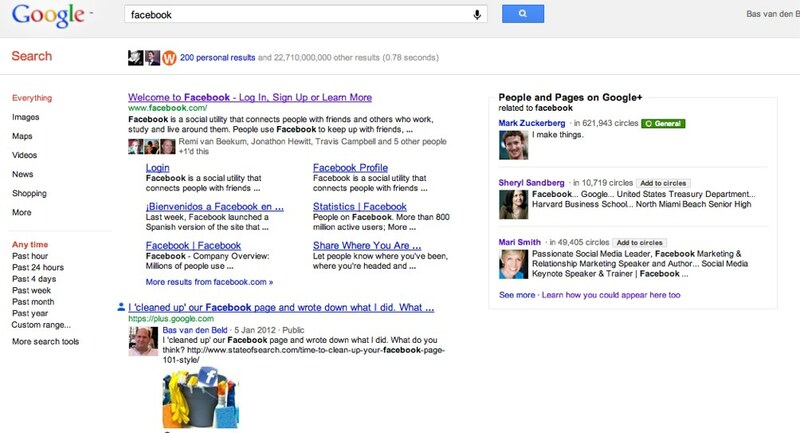 The fact that Social Profiles are being highlighted in the SERPS. And how we can make use of that. Google Suggested lists have been around longer than this week. They were added to Google+ last September. They work similar to the Twitter suggested lists you can see if you do a search on Twitter. The biggest change now is that they have been added to the ‘regular’ SERPS. The reach therefore is a lot bigger. Still, because they were here already, if your strategy was right so far, you won’t have to do that much different now. Now the interesting part is how can we get into those lists. Google said it themselves, having a Google+ Profile will help you get featured. After all, for now, they are only showing Google+ users there. Oh how I hate it when I see this one in other posts, and now I am actually writing it down myself: your content needs to be interesting. I hate it because it is so obvious and I don’t consider this a tactic or a strategy: if you don’t have interesting content there is no way people want to read it so why even talk about optimizing if you can’t be interesting in the first place? It is a ground rule: your content has to be in the right shape. Also, it seems very obvious, but apparently for many it isn’t. If you want to become visible and you want to be ‘recognized’ by Google as an authority which should be a ‘suggested user’ it should be clear to Google in what area they should suggest you. If you switch around too much content wise Google won’t be able to figure that out so stick with the topic you feel you should be an authority on. Make sure you share your content. And for now the best place to do that is on Google+, since that is what Google is looking at most at the moment. There are still people who hesitate setting up a Google+ Profile or Business Page. I always urge them to do this as quickly as possible. At this moment Google doesn’t have a large history when it comes to social data so they want to build that up as quickly as they can. That means they will try to get their hands on as much as possible. If you are not there now you are not only missing out on the opportunity to be visible NOW, where others are still waiting to see if this will become a success or not, you will also miss the advantage of being there first in the long term: building up trust and authority. Something where Google will be looking at (see below). Make sure therefor you provide Google with the right information. So we’ve set the ground rules, if you have been doing things right you either were doing them already or you only have to do some minor changes, right? Now lets go for the good part: how to actually stand out and increase the visibility chances even more. One of the basic ground rules was “stick with your topic”. There is one step you should set before that: defining your topics. It is like basic keyword research: what topics do you want to be suggested in. That means find out what people are searching for and figure out where the best opportunities lie to be visible. Here you have to think in the same way like when you are doing keyword research for your website: it has to ‘speak’ to your audience (right terms) and you have to know your competition. If you for example do a search for “Facebook” you will find that the suggested users on the right are dominated by people who are very closely related to Facebook: founder Mark Zuckerberg, his ‘right hand’ Sharyl Sandberg and Mari Smith, a Social Media Speaker, Trainer, and Author. There is no way you will get in between those three unless you write a hugely successful book about Facebook or you build the Facebook killer. You have to find an area in which you feel you should be a suggested user and focus on that area. Now at this point that can be difficult to figure out because Google is not giving us suggested users on every term. But if there are no suggested users at this moment of time, that doesn’t mean there will never be any. The best you can do is, just like with keyword research, find the one which fits you best, has enough searches per day on it and doesn’t have competition you can never beat. Try to get into that area by posting and writing about that topic. There seems to be still room in the “SEO” section ;). There is one thing which I think some people will underestimate: the power of the author. Google has been ‘pushing’ author related elements (rel=author for example) a lot in the past few months, and with reason. Google wants to make sure that the people they recommend and the content from people they recommend is from an authoritative source, people should trust the person who shares the content. Therefore Google will favor authors with a high profile. It is not without reason that on almost every search I do which is related to Search Marketing Danny Sullivan pops up. You have to therefore work on your author profile. Fill out your Google Profile and tell Google where you are publishing your content and make sure you have all the rel=author elements set up. Also, make sure you get enough links to your profile and very important: have other people share your content and your profile. Yes, its true, you have to get social (mostly on Google+) to get featured. You have the account(s) set up, you should share. Share about your topic. Don’t spam, be original and all that stuff, but most important: try to encourage engagement. The more engagement, the more chance on becoming the authority. Part of this probably means trying to get into as many circles as possible. I am a bit hesitant in saying this because I don’t want to trigger the follow- unfollow game on Google+, but being in many circles increases the chance of your content getting socialized. There is a big BUT to all of this. While we’ve been focussing on Google+ here it turns out that it is NOT just about Google+. I showed yesterday that Google is not just suggesting people who share a lot on Google+, it’s on other properties as well, like Blogger for example. This means we should share our content not just on Google+ to get suggested, but on other properties as well. Should that be a Google property though? For now yes, so it seems. But I wouldn’t be surprised if Google’s actions this week are also part of politics to get back into the “firehose” of Twitter for example, so I wouldn’t just use the Google properties, even though they have more weight now, but I would share as widely as possible. It may seem there is a lot you should do, but as said, if you have done things well in the past year or so there are only some minor adjustments you have to make. Key is the focus on your profile, that should stand out on your topics. It really is so important being that suggested user, but its so time consuming…. its trying to find time to FB, Tweet, be on LinkedIn, Blog and be on Google +…. so difficult, but totally agree it has to be done! I try and do it all, but i am sure i am not as good as i could be if i concentrated on just one of them! Jonny, you could use Friends+Me to post to Google+ and then it posts to all of the other social networks, that’s what I do. A bit off-topic, but can a company profile on G+ be used for rel=”author”? Thought so.. 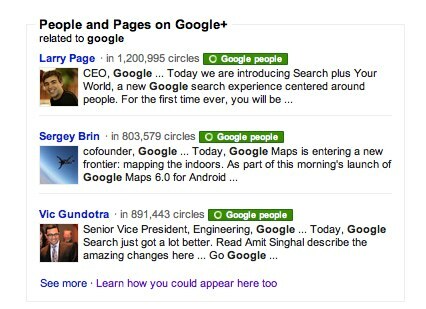 Otherwise, do you think the same principles apply to company profiles on G+ in order to become suggested pages? E.g. when being logged in you search for “cars”, G+ pages of Ferrari and BMW show up as suggestions. Partly yes, but I also think that relevancy of the actual brand will play a role here. See the Facebook example. Even though Facebook won’t be using Google+, they will still show up as suggested because they are highly relevant to the search term. So if you sell cars and try to get suggested for sofa’s I don’t think spamming the crap out of Google+ on sofa’s will actually work. I don’t really like that you HAVE to be on Google+ now or it wil end up affecting your SERPs – but you have provided some great info here, so thanks for that! We recently had our Twitter account suspended for aggressive following. 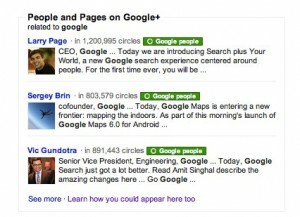 I wonder if Google+ will ever have something like this? We are basically on Google+ because we have been scared into it, not because we see any type of traffic from it. We read so many articles telling us to share on Google+ or suffer the wrath so we do. Hope it pays off!! Great article thanks for all the information.